Near revelations continue as our ladies go about their day elegantly. Moran comes to Hyunsook’s defense literally by attacking Hyun-Ae and Mari ends up unintentionally confessing to Roo-Oh. As Soon Ok turns around to face Chulhee, a newspaper flies into her face. Chulhee sees Soon Ok struggle with the newspaper and laughs until more wind blows dust into his eyes. By the time that Soon Ok has pulled the newspaper off of her face, Teacher Hwang is back and is blowing into Chulhee’s eyes to get any dust out. Not able to see anything but Teacher Hwang’s back as he leans into Chulhee, Soon Ok smiles in a shocked manner and walks off quickly. Missed encounter 1 between the previous couple! A younger Soon Ok dusts her husband’s home office and finds the diamond ring in his drawer. She turns around to see her birthday circled and naturally assumes that her philandering husband has matured and bought her a marvelous birthday present. At her birthday dinner, Soon Ok happily accepts facial cream from her daughters and waits expectantly for her husband’s gifts. Chulhee proudly exclaims that he has bought many gifts for Soon Ok and hands over …an apron…silver utensils…and leather gloves. Seeing his expectant expression, Soon Ok realizes that the ring was not her present and has to mask her disappointment awkwardly with enthusiasm about her leather gloves. The next day, Soon Ok visits the ring shop to find out about the value of the ring and also learns that the silver utensils set was a free gift that came with the ring. Furious, Soon Ok orders a less expensive replica, with which she replaces the diamond ring in Chulhee’s desk drawer. OMG, Soon Ok is a boss! I can’t believe that she basically forced her cheating husband to propose with a fake diamond ring while she kept the $50,000 original. No wonder she was so happy to call a family meeting with a jewelry expert. As her flashback ends, we see Soon Ok sigh that she didn’t expect Moran to actually appear with the fake ring. All the meanwhile, Chulhee speaks with his friend outside the store. Meanwhile, Roo-Oh bangs on Mari’s door to demand that she join morning practice. Instead of Mari, an annoyed Hyunjung opens the door, which sends an embarrassed Roo-Oh off sheepishly. When he arrives at his kendo dojo, he finds Mari already dressed and ironing his own uniform. Roo-Oh is digesting the information that Mari is no longer living across from him when another member of the dojo interrupts to announce that a neighborhood dojo has come to spar with them. Hearing which dojo dropped by, Roo-Oh orders that Mari skip the morning practice, as the dojo has a member who is infamous for being a tough sparring partner. Mari refuses to skip practice just because she’s a woman and she’s warned to be extra cautious when sparring with the man with a scarred foot. The sparring starts and Mari manages to defend well at first pass. Then Mari gets over confident and actually attacks only to be sent flying backwards. She lands on the ground with a thud and the sparring stops as everyone looks over in concern. Roo-Oh immediately runs over to ask if Mari can get up and Mari tries…only to give up and admit that she cannot get back up. At the same time, Moran checks out Soon-Ok’s kitchen until Soon-Ok arrives and notes that she hates it when anyone searches through her kitchen. As Soon-Ok gets ready to cook, Moran nonchalantly comments on Soon-Ok cooking with the diamond ring on as she has never seen any famous chef cooking with a ring. Soon-Ok smiles that she wanted to return the ring to Moran. She knows that even though she left the envelope of money at Moran’s place, Moran had transferred the amount to Hyunsook who then transferred it to Soon-Ok. She explains that she hasn’t touched the money, but will spend around $50,000 of it now in return for the ring. Moran asks Soon-Ok why she won’t just accept the money and Soon-Ok responds honestly. People can give a gift and then regret the gift of the amount. Hearing this, Moran replies that that she doesn’t regret the gift and considers it a fitting punishment for her sins; when she was younger, she had been so lonely that she had agreed to meet with Chulhee whenever he asked and even gone on dates. Soon-Ok smirks that Moran must be feeling better and Moran confirms that she feels much better thanks to Soon-Ok’s healthy food; she also takes the chance to ask why Soon-Ok continues to take care of her. Soon-Ok answers that she does it so that she can get to the bottom of Moran and Chulhee’s relationship. This honest but civil exchange is endearing as both women have laid themselves more open to each other and ends with Moran keeping her dignity as she ends with the statement that she doesn’t regret anything before leaving. It’s a bold phrase to tell the wife of your paramour, but I think their relationship has changed from just that of the wife of the boyfriend and mistress to one more akin to sisterhood. Back at the hospital, Mari insists that she’s fine now to Roo-Oh’s disbelief. He ends up testing her self diagnosis by tickling her on her feet until she kicks him. Accepting that she’s fine and doesn’t have a concussion, they get her discharged and have an awkward moment when Mari realizes that no one brought her slippers. Roo-Oh offers hers, but accepts them back when Mari avers that his slippers are too big for her. However, as they walk out of the hospital, Mari steps on a rock and Roo-Oh picks her up to carry her. 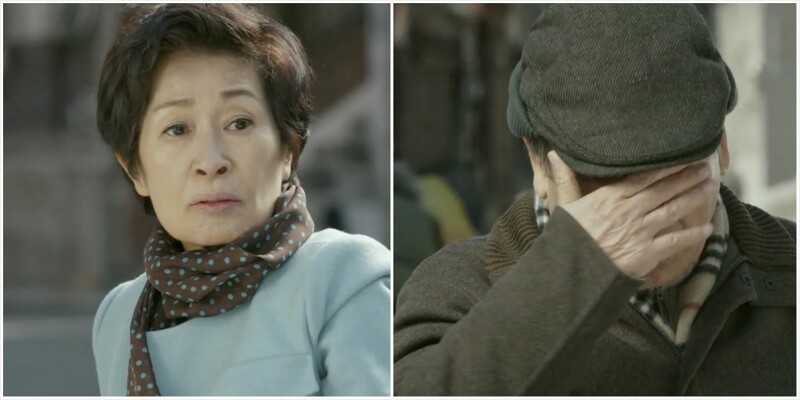 Meanwhile, Doojin meets up with Hyunsook to let her know that his father has actually passed away and hears about her past expulsion as well as her current goal of getting the expulsion expunged. Sympathizing with her cause and not realizing that it’s his mother’s fault, he agrees to help her out. Mari gets ready to leave the kendo dojo and on her way out asks Roo-Oh if they could listen to ambient noise instead of classical music when they cool down and medidate. She lets him listen to the files that she recorded on her phone to support her suggestion and he agrees. Then on her way home, Mari pauses to record the sound of wind-chimes until she gets interrupted by Do-Jin who is on his way to the art gallery. Mari gets excited by the gallery and agrees to join. At the same time, Hyunsook and Moran visit the same gallery exhibit with the tickets that Mari gave her. They pause in front of a picture as Hyunsook snacks and she comments that she doesn’t really understand art. Moran responds that she thinks it’s more of each viewer’s experience and Hyunsook decides to grab some more snacks instead. However, when Hyunsook gets over to the snack table, Hyun-Ae spots her and accosts her at the food table. Hyun-Ae complains that they are letting everyone come to galleries these days and orders that Hyunsook leave as soon as she’s done eating. Hyunsook tries to stand up for herself by asking why Hyun-Ae has to be a such a witchy woman and Hyun-Ae basically dismisses Hyunsook as bringing down the prestige of the gallery. Overhearing this exchange, Moran cannot but help herself as she stalks over and grabs Hyun-Ae by her hair, demanding that Hyun-Ae apologize to Hyunsook. Hyun-Ae tries to fight back, but Moran has too firm of a grip and insists that Hyun-Ae apologize. When asked, she answers that she did not accompany Hyunsook to the gallery…she is a patient who came here alone to rest and recuperate but could not stand to hear Hyun-Ae’s uncalled for words. This doesn’t get far as the security guards come to Hyun-Ae’s aid and pull Moran off of her…They drag her out, but not before Moran is able to toss cookies at Hyun-Ae for good measure. 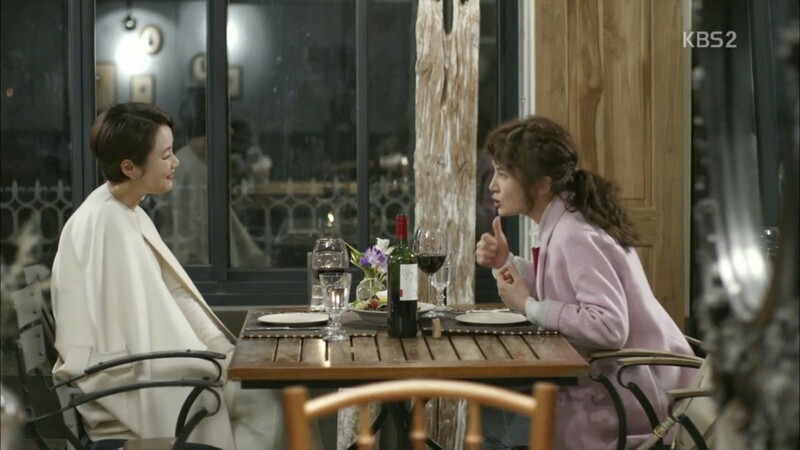 Moran takes Hyunsook out for a glass of wine afterwards to celebrate and Hyunsook confesses to feeling so happy and relieved. Meanwhile, Mari and Do-Jin arrive to find Hyun-Ae in a horrible mood. She complains about having a bad encounter and having digestion issues so Mari provides some pressure therapy to relieve the discomfort. This completely makes Hyun-Ae happy as a distinguished professor is doting on her. Back at home, Moran and Hyunsook arrive in a wonderful mood to her mother’s jealousy and irritation. However, when Hyunsook goes into her room, she finds her husband reading her petition. He comments how it was too long ago for the school to do anything and rather encourages her to focus on passing the test to get into college. When Hyunsook doesn’t seem as cooperative, he threatens to expose her secret and starts dancing around until Hyunsook’s mom comes in to find Hyunsook pinning him to the wall. Smiling broadly, she turns off the light for them. A flashback reveals the secret to be an embarrassing situation where Hyunsook and Jong-Mi had excitedly prepared for an audition… Only to get scammed by a fraudulent entertainment company! Hah! The morning, Roo-Oh sends Mari a bunch of snacks and a sweet note through the student that had originally asked Mari for help. She asks him what she can do for him and be confesses that when he’s around her, he doesn’t have any suicidal thoughts. Hearing that, Mari smacks him with a pillow and promises to help. 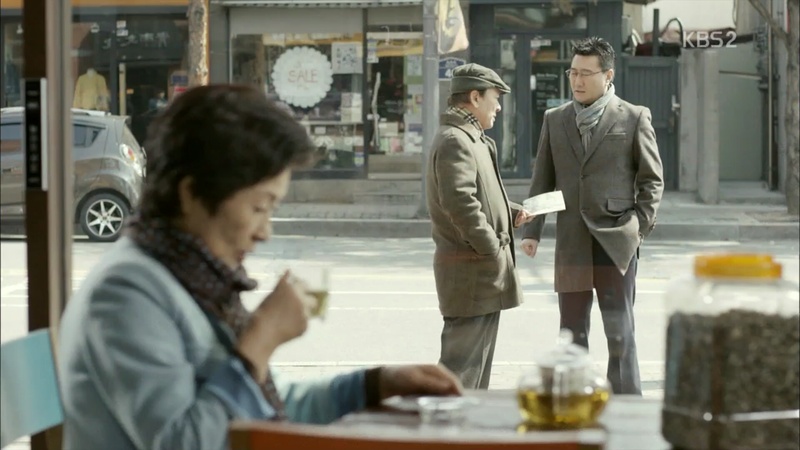 At the same time, Do-Jin’s uncle engages in a photoshoot and Eunshil drops by Hyunjung’s house with side dishes. Before Hyunjung comes out of the shower, Eunshil helps herself to around $30. When Hyunjung does get out of the shower, Eunshil stands there nervously as Hyunjung tells her to wait… Opens up the wallet and grabs another $30 to give to her for commuting costs… Oh dear. Back at the photoshoot, Do-Jin’s uncle asks which picture he likes better and then doesn’t take Do-Jin’s recommendation as Hyunjung chose the other picture… Someone has a crush! We return to Soon Ok’s house where Soon Ok has invited all the girls for some cold buckwheat noodles. It gets more hilarious bc Moran appears wearing rings on both of her hands just to show that she doesn’t need another diamond ring! This episode felt like a Korean version of Little Woman. It felt so slice of life drama-esq about these woman. For example, I really enjoyed the little details like how Moran wore all of her choice rings for dinner at home and Soon OK visibly got jealous of the developing relationship between Moran and Mari. It’s like even though these woman were brought together because of Chulhee’s infidelity, they can become like sisters despite the circumstances because both have been sincere to each other in her own way. The other interesting question that this episode proposes if whether the circumstances affect our decisions or if our decisions are separate of the circumstances. For example, all of the missed connections with Soon Ok begs the question of whether Chulhee would have fallen in love with her and not Moran had he met her first…Or is it that even if he had “met” Soon Ok first, he will still fall in love with Moran? I chose the word “met” since he has already “seen” Moran. However, unless we are talking about the chemical reactions that occur, which make people believe in love at first sight, I think that love is something that grows deeper by getting to know the person. In this case, while Chulhee has “seen” Moran, he has not gotten to know her. This question also lightly touches upon the soul-mate situation. I would be interested to see if the writer chooses to play this out.